Glasgow Warriors have secured hookers Pat MacArthur and Fraser Brown on new two-year contracts until May 2018. 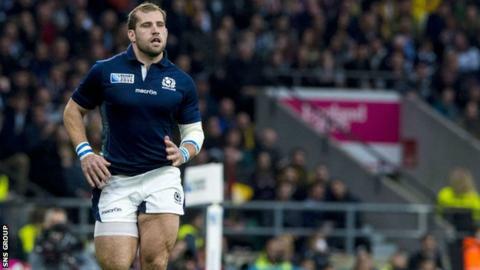 Brown, 26, featured in all five of Scotland's World Cup matches last year, starting in the group defeat to South Africa. The former Edinburgh player won his 15th cap as a replacement in the quarter-final loss to Australia. MacArthur, 28, made the last of his six Scotland appearances in 2014 and has been at the Scotstoun club since 2007. "I've really enjoyed my eight years and it was an easy decision to stay," said MacArthur. "Everything about the Warriors has grown since I joined and I'm really excited about the future." Brown made the move to Glasgow in 2013 and was a second-half replacement in last season's Pro12 final victory over Munster. "Winning the Pro12 was one of the highlights of my career and I'm really looking forward to the next two seasons at Scotstoun," said Brown.